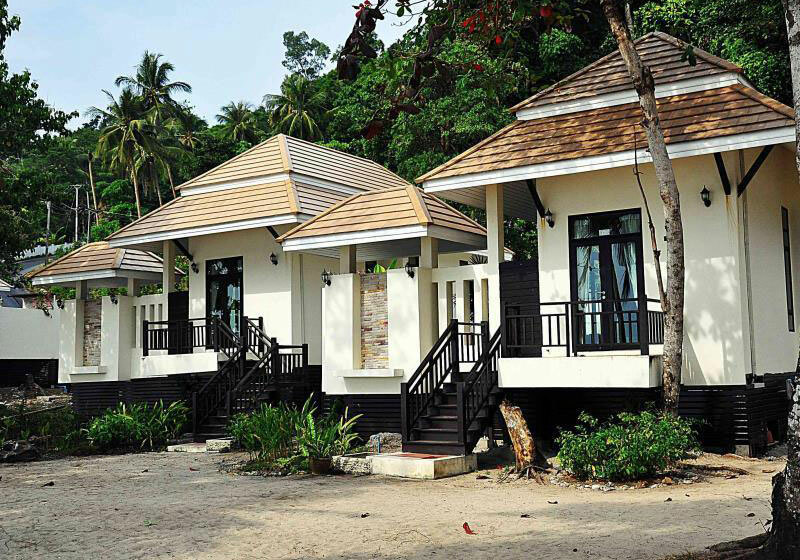 Siam Beach Resort occupies one of the best locations on Koh Kood and is one of the few accommodations with bungalows practically on the beach. They have the widest beach front of all resorts on the island and offer six different room types built in rows and overlooking stunning Bang Bao Bay. From the main road on the island is an easy to follow concrete road of a few minutes by motorbike to Siam Resort. Take the exit to Bang Bao Bay next to Baan Suan Homestay & Coffee. Next to the resort and easy to walk to are Siam Hut, To The Sea Resort, The Beach Natural Resort, Sand & Sea and Koh Kood Resort, all of them are nice options for eating out. Short Description: Siam Beach Resort occupies one of the best locations on Koh Kood and is one of the few accommodations with bungalows practically on the beach. They have the widest beach front of all resorts on the island and offer six different room types built in rows and overlooking stunning Bang Bao Bay.